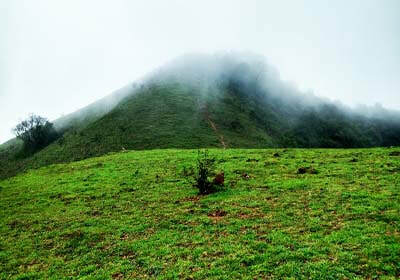 Shishilagiri Hills/Shishila Gudda/Ettina Bhuja is a hidden trekking place near Muidgere, Chikmagalur. The trek to Ettina Bhuja is moderate. It is ideal for trekking enthusiasts, especially those with limited experience. 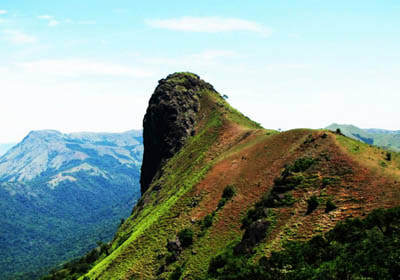 It is one of the numerous peaks in the Charmadi Ghats region of Karnataka. The name Ettina Bhuja is derived from classical Kannada meaning 'ox's shoulder'. The peak resembles the hump on an ox's back. 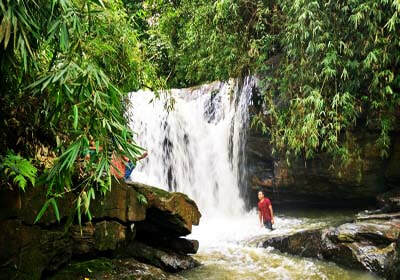 The trekking trail to Yettina Bhuja begins from Bairapura - 3 kms trek to peak, 9 kms from Gowdahalli Forest Homestay, Mudigere, 15 kms There are 2 routes to trek, one is from Bairapuara and another is Holegundi. For over an hour, one treks alongside the stream through patches of leech land. Thick canopy of trees, gradual ascent and an undefined trail are the highlights of this stretch. Devrunda Temple is a beautiful representation of the fine detailing and craftsmanship that was the hallmark of the Hoysala architecture. Constructed between the 11th and 14th centuries AD, the temple gives the destination its name. The temple dates from the period when the Hoysala empire was at its peak. Located at the entrance of the town, the temple is a remnant of the Hoysala Empire that ruled this region between the 11th and 14th centuries AD. This place is known as Dakshina Kashi, here you can find Rameshwara, Veerabhadreshwara, Bahireshwara, Parvati and Ganapati. This temple has been built in over night and it is said to be over 500 years old. 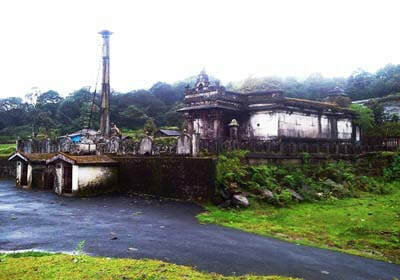 Kala Baireshwara Temple known as Devaramane temple located in Mudigere, Chikmagalur. This region is well known for chain of hills in western ghat. The legend tells that Lord Shiva sends his vehicle Nandi to help the people (formers) on the earth, Nandi first came to a place on a hill of western Ghats (shola forest) and today's Devaramane, Kalabhairava is known as the incarnation of Shiva. The temple has the long history and culture. If the walls of this ancient temple could talk, it would tell stories from 900 years ago when the Cholas ruled this land. Patiently watching over its jungle that must have been a hundred times wilder, the architectural extravaganza of Devaramane. Magajalli Falls/Abbi Falls/Hanbal Falls is a roadside waterfall nestled in the Western ghats near the town of Sakleshpur in Karnataka. It’s calm, serene, undisturbed and easy to miss unless you have a local person with you. Very nice waterfall cascading for about 20 feet in its glory. Water flow will be there almost throughout the year. It’s just 10 kms from the our homestay. 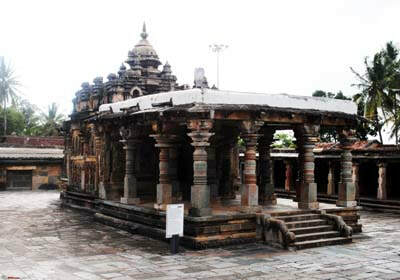 Bettada Baireshwara is an ancient temple which is said to be over 600 years old. It is an hilltop temple and overlooks the entire valley. 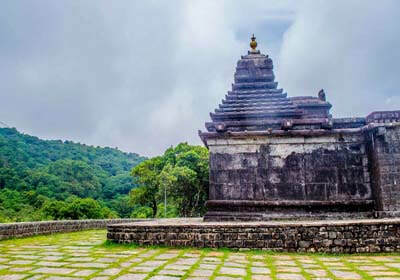 Stand there and get mesmerized by the glorious views of the hills in the Western Ghats and the valley and wonder how someone thought of building a temple here. God Baireshwara seems to stand guard over the entire valley. There is a nice motorable road, though steep, leading to the temple. One can also climb up to the temple through steps that have been built. The temple is just 10 kms from the homestay. Pandava hills is located near Bettadadevara Gudi, in Mudigere taluk. The freshness of the air, the misty hill, the moment we climb half the hill the question arises will we be able to climb top of the hill? but we can. It is an trecker place where we can enjoy the walk in grassland and amazing sunset view from peak need to be experienced. There is a story told by elders that Pandavas in Mahabharata had stayed during Vanavasa. We can see some beliefs through big grinding stones etc. It’s an ultimate sightseeing in the whole surrounding. So this place is gradually becoming more and more popular. This hill is just 11 kms from the homestay.